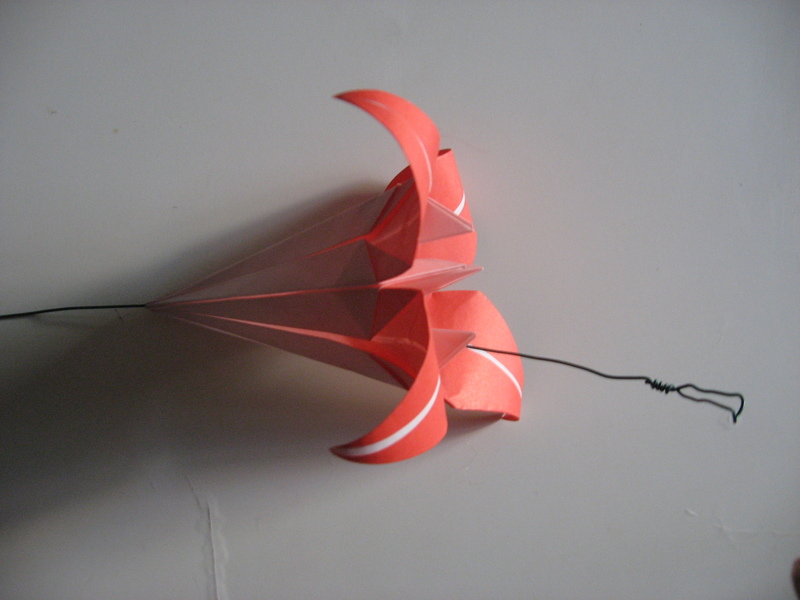 Part I, on how to make the flower, is here. This second section is on how to make the stem. I used 24 gauge floral wire, scissors, needle nose pliers, and green washi tape (Japanese masking tape). 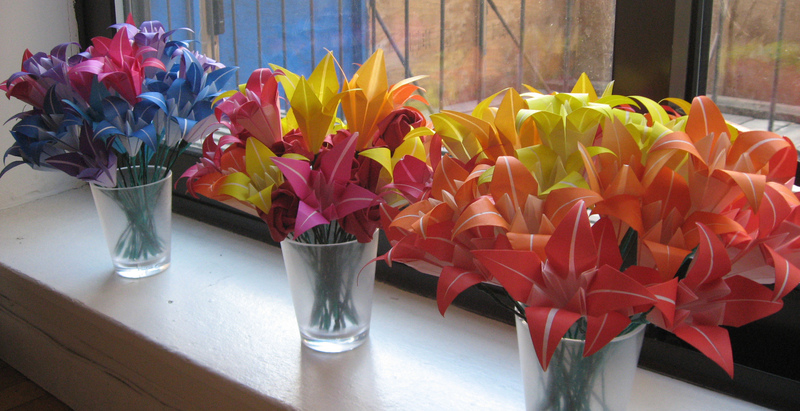 I made many flowers with floral tape, but I got sick of my fingers being sticky all the time so I switched since I was buying origami paper at the Japanese store anyway. 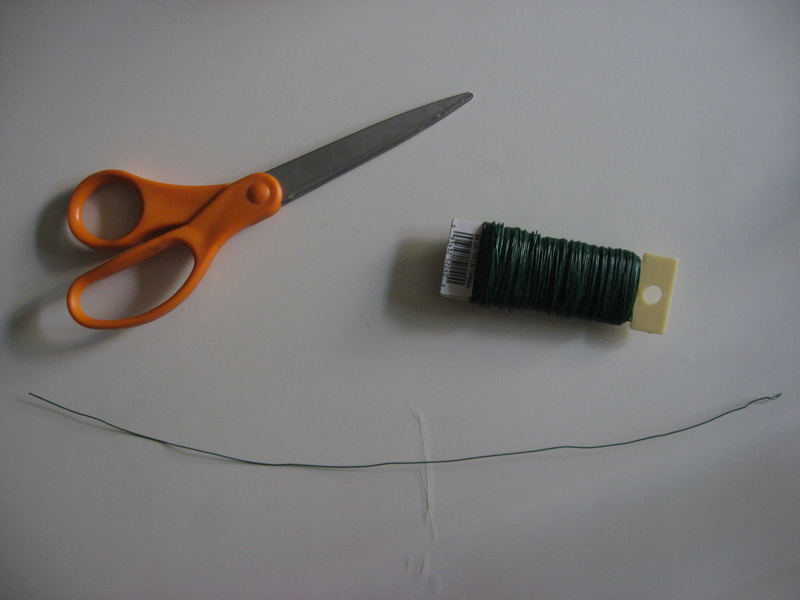 First, cut a length of wire. Leave 1-2 inches more than the length of the stem you want. 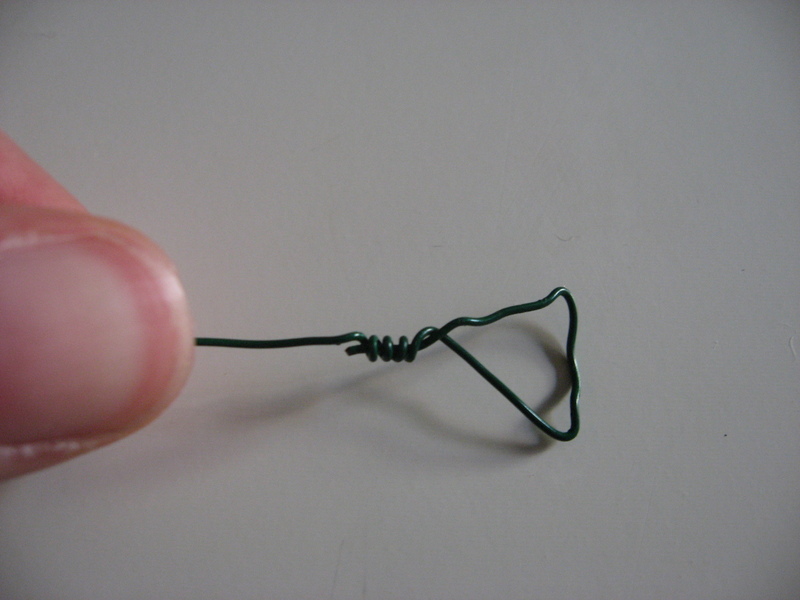 Use the pliers to create a triangle on one end of the wire. 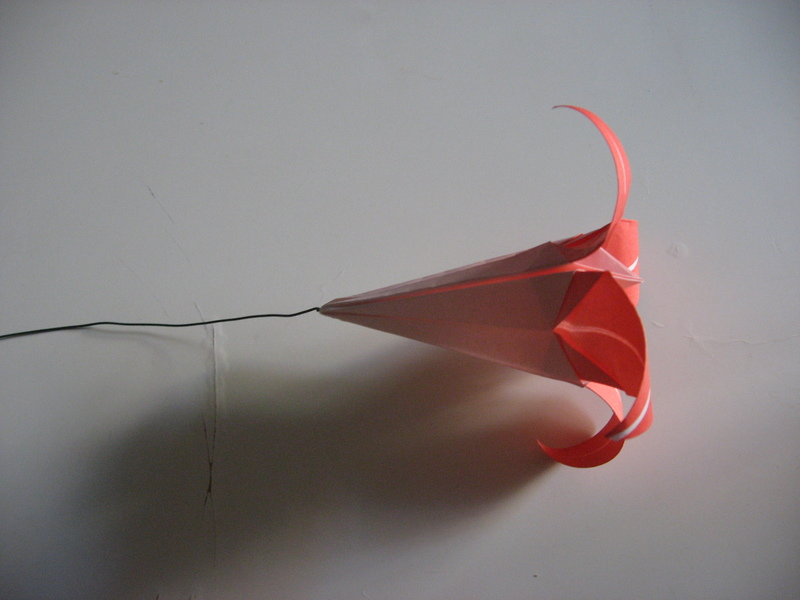 Take the long part of the wire and wrap it around the short end of the wire to secure the triangle shape. 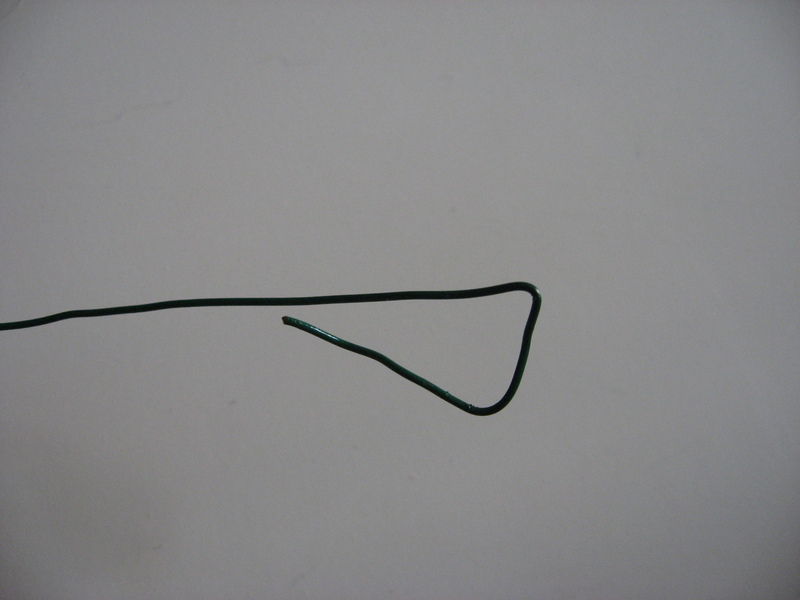 Bend the top of the wire slightly so the top of the triangle forms a “L” shape. 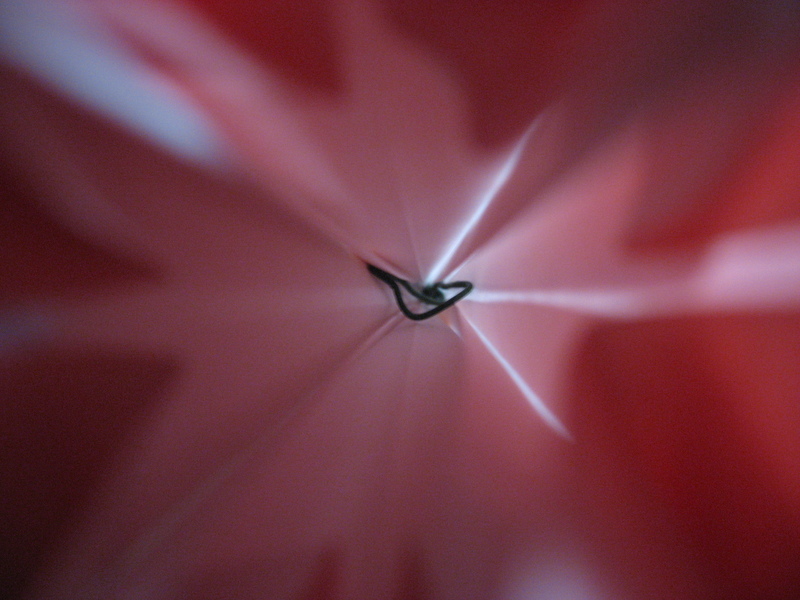 Insert the the long end of the wire into the top of the flower. 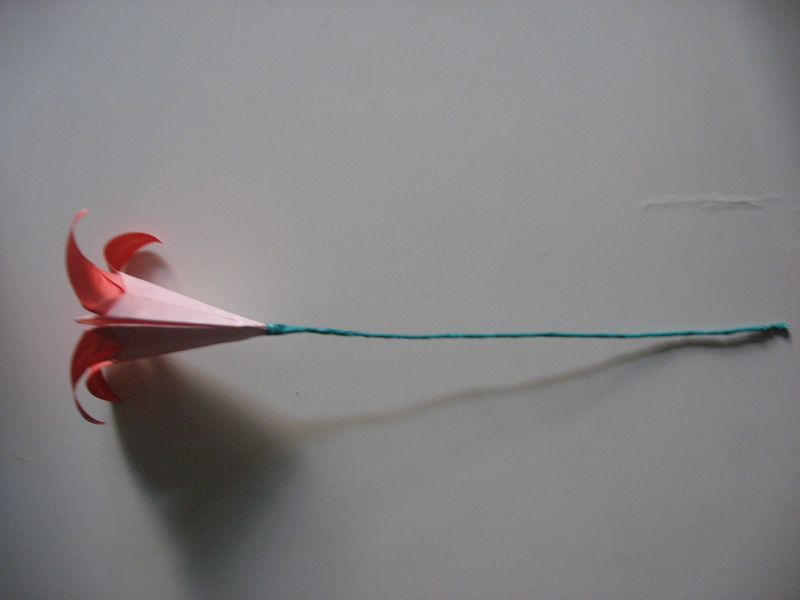 Use the sharpness of the end of the wire to pierce through the bottom of the flower. 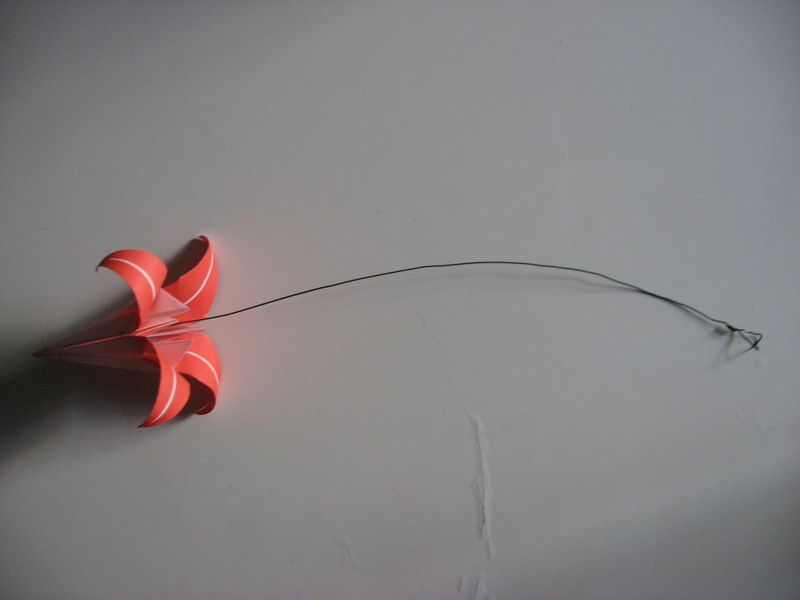 Bend the wire up and around, aided by the pliers, and wrap it around the base of the flower a few times. Bend the wire back down to form the stem. 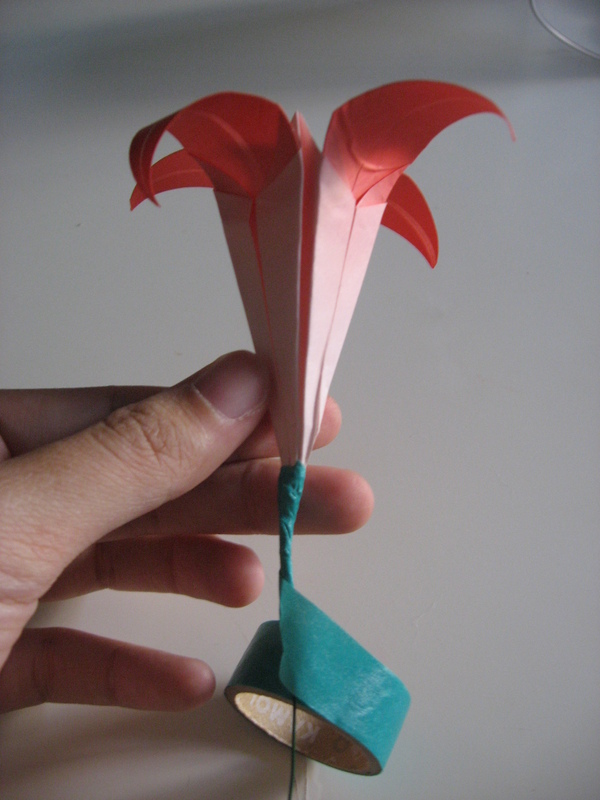 At this point the flower should be very well secured to the stem. 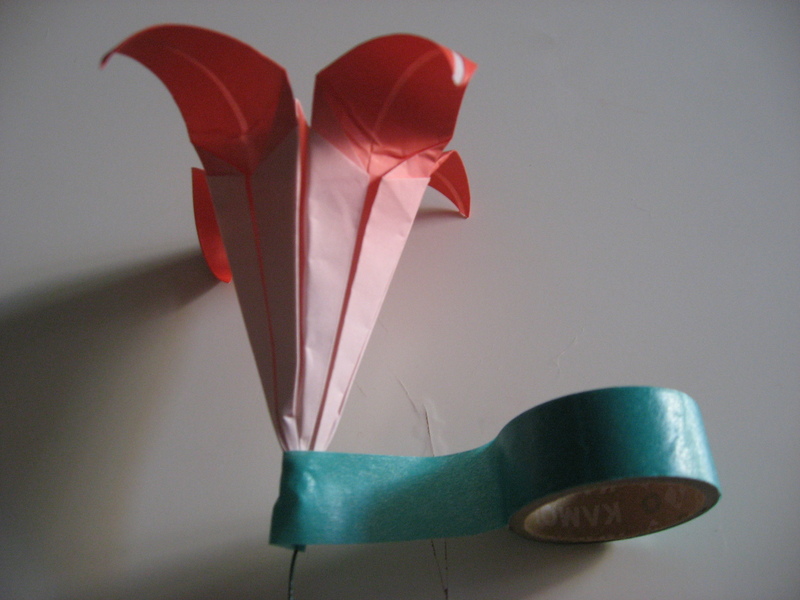 Take the tape and wrap it around the base of the flower, covering the part wrapped by wire. 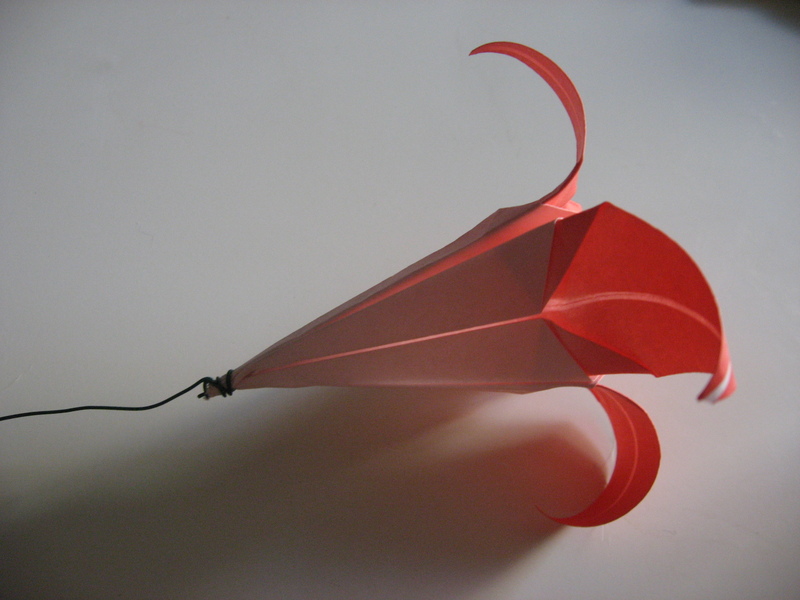 Angle the tape and continue to wrap down the length of the stem, making sure to tighten the wrapping as you go. When there is only about 1/2 to 3/4 inch of exposed wire, cut the tape and finish wrapping neatly. Bend the wire back on itself, creating a nice curve at the bottom. Wrap the wire around to secure the ends of the tape from coming off. 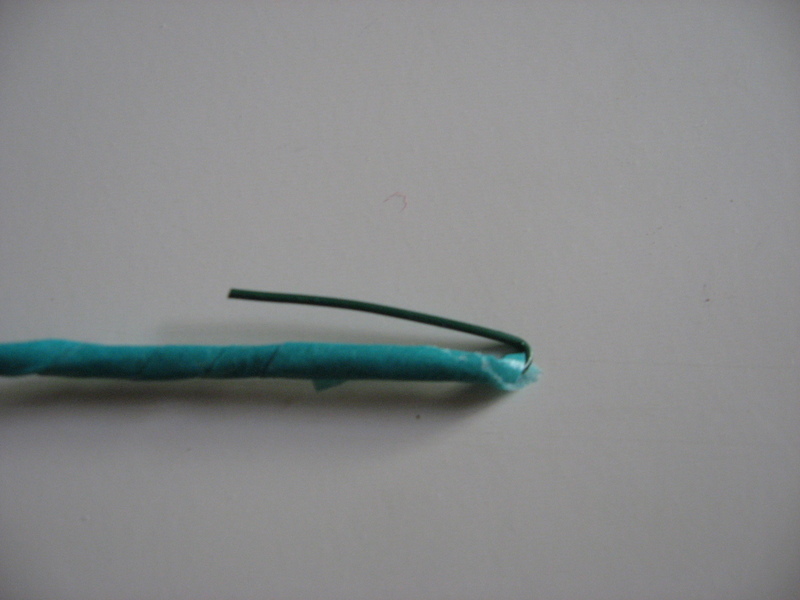 Tuck the tip of the wire into the tape so the sharp edge is not exposed. 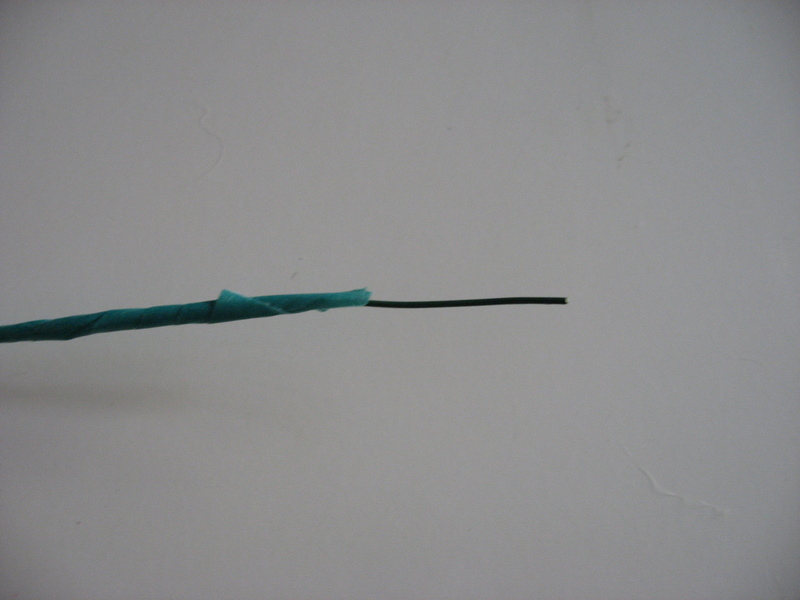 If you are confident that your tape is sticky enough (or you’d like to glue it), you can curve the wire back and then wrap the tape on top of the wire, so the sharp edge has no chance to be exposed. And ta-dah! you have a flower. 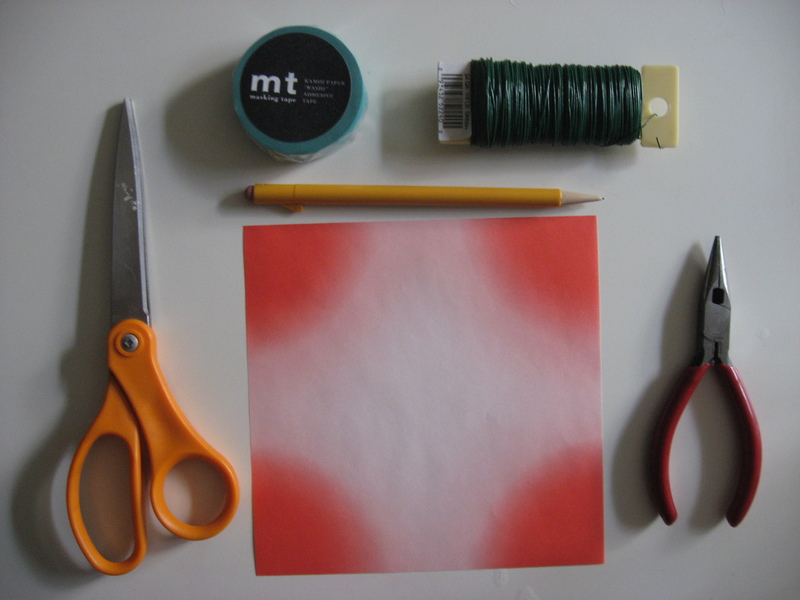 You can enhance a single flower by inserting green paper leaves into the tape as you wrap, or make several flowers (as I have) to make a bigger impact. So there you go internet, hope someone finds this helpful.